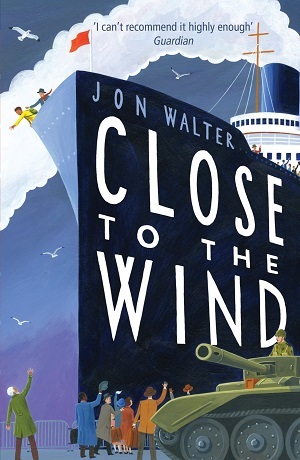 Walter’s second book, My Name’s Not Friday, may have been longlisted for The Guardian’s Children’s Fiction Prize this year, and nominated for the 2016 Carnegie Medal, but in case you are waiting for the paperback (July 2016), I suggest you read Jon Walter’s first book first, Close to the Wind. It was longlisted for the Carnegie Medal last year, and is a great piece of literature. Close to the Wind tells the story of Malik, a refugee waiting with his grandfather for a ship to carry him across the sea to a promised land, where there are big houses with white picket fences and post boxes at the front gates. In order to secure them a place aboard, his grandfather makes a deal, but it’s not the one Malik imagines, and in the end, Malik must dig deep for the courage and tenacity to travel, and find a way to perfect a magic trick that might just save him. This book works well in three different ways – keeping the reader in thrall to the very end. Cleverly conceived, although Malik is given a name, there are no clear indicators of time or place, so that the soldiers, the ship, the deserted houses, and the cast-aside animals drop clues to the reader but could belong to any war-torn country at any time. Malik becomes the everyman refugee – an everyboy. Secondly, the plot is tightly planned so that everyday boyish incidents which seem trivial in the first part, become crucial to the second. Every action predetermines another – every thought is consequential. Saying that, it’s not a hard book to follow – the writing style weaves along simply enough so that the reader is swept along on the journey with Malik, and the plot reveal of Malik’s accomplished magic trick is breath-taking. And thirdly, this simple story is jam-packed with emotion. From the anticipation of the journey aboard the ship at the beginning of the story, to the anger at betrayal, to a small boy’s fear of abandonment, and his bewilderment at the behaviour of others, to the abiding tension of whether he will ultimately succeed in his quest, his longing for resolution, the promise of the new and the remembrance of the old. There is no let up to the inner turmoil and conflict of the characters. In this way, it is a perfect read for our age – a perfect vehicle for empathy with those fleeing their homelands, for any child lost in an adult world. The final reconciliation brings so much joy that any reader will weep with relief and happiness. I wish there was a sequel – I was reluctant to leave Malik, even in the good hands he finally found himself. This is Jon Walter’s debut novel. It is truly accomplished, so you won’t want to wait for the paperback of His Name’s Not Friday, you’ll want both books…as soon as possible. Recommended for 9+ years. You can buy a copy here. Or go to http://www.davidficklingbooks.com/ for a signed copy. I would like to thank Jake Hayes and Jon Walter for sending me a copy of the book.